As the Anglian Home Improvements motto says, “Raising the Standard”, we try to implement this into all our daily routines and all our product ranges. The latest example of this is in our Bay Windows. We have improved not just the aesthetics of the window, but also its performance by improving the UPVC Bay arrangement to reduce the likelihood of condensation forming on the bay pole cover. An insulating material is applied to the internal face of the pole, which is then covered with a new internal trim. 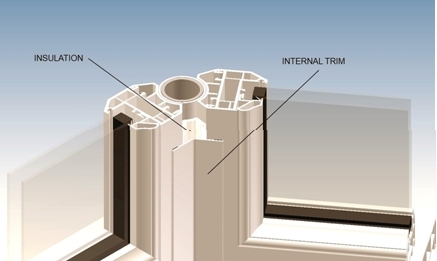 The trim is available in all of the colour variants, so you won’t have an unsightly strip of the wrong colour running down your beautiful bay windows. This change may seem small, but it improves the visual appearance of the junction between the window mainframe and the sill, meaning you have even more attractive bay windows that perform to the highest of standards.